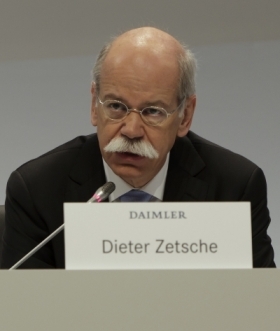 FRANKFURT -- Daimler AG said it expects an involuntary-manslaughter investigation into CEO Dieter Zetsche to be dismissed after a previous court found no fault with the company. "The initiation of the investigation against the board member represents a pure formality," the company said in an e-mailed statement Friday. "We expect that the procedure will be dismissed." A 27-year old-Daimler engineer died at a test track in Papenburg, Germany, following an accident caused by an intern, the Sueddeutsche Zeitung reported Friday. The intern was convicted over the issue. Daimler said in the statement a decision on July 12 by a district court in Papenburg found that neither the company nor the chief executive held any responsiblity. The Stuttgarter Zeitung reported earlier that the parents of the 27-year old engineer felt the company should not have put the intern behind the wheel of a fast car on a test track.